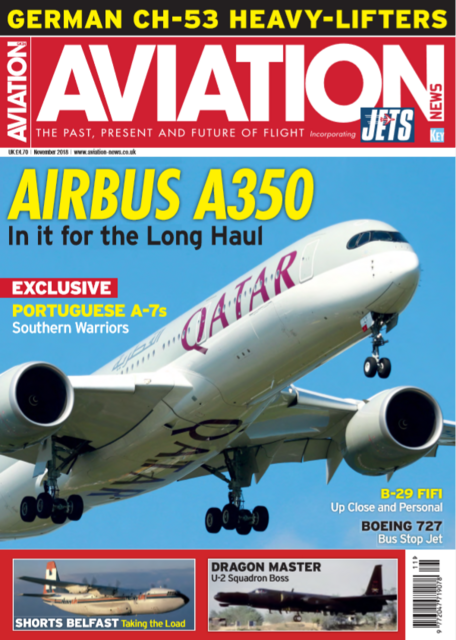 Aviation News - November Issue - OUT NOW! 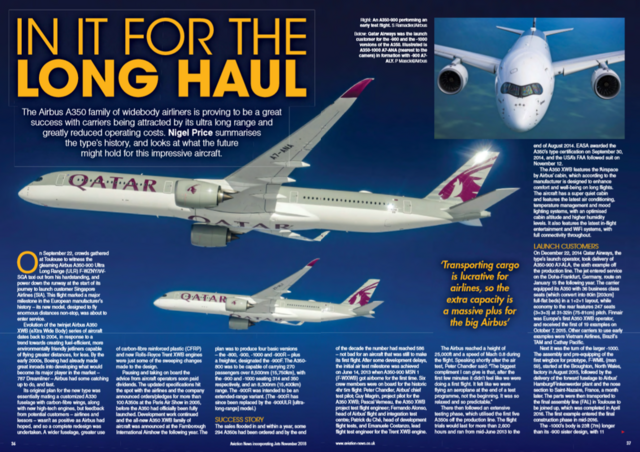 The Airbus A350 family of widebody airliners is proving to be a great success with carriers being attracted by its ultra long range and greatly reduced operating costs. Nigel Price summarises the types history, and looks at what the future might hold for this impressive aircraft. Lt Col Rick Bishop recounts his odyssey within the top-secret world of the U-2 and his time as command officer of the only operational squadron of this unusual intelligence gathering aircraft. From supporting NATO operations to performing mercy missions and fighting wildfires, Germany's CH-53s have excelled in testing tasks. Dr Kevin Wright visited their Laupheim base to learn more about their work. 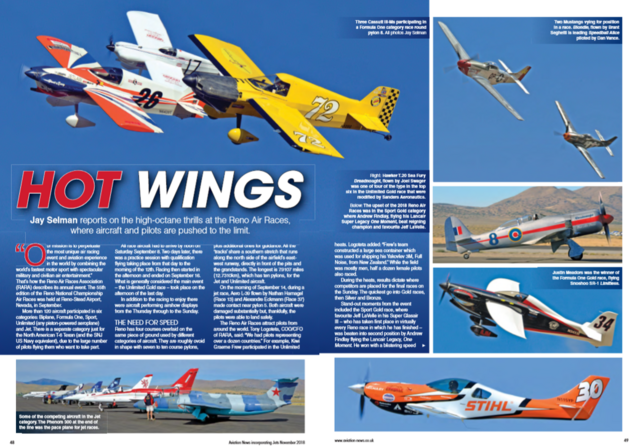 Jay Selman reports on the high-octane thrills at the Reno Air Races, where aircraft and pilots are pushed to their limits. The Commemorative Air Force's B-29A FIFI is one of only two Superfortresses flying in the world. James Careless caught up with the bomber in Gatineau, Quebec, during her annual fund-raising tour of North America. Doug Gordon profiles the A-7P Corsair II's service with the Portuguese Air Force. Aviation News is AVAILABLE NOW for just £4.70 from the Key Online Shop.Alternatively, you can purchase your copy from WHSmith, any other leading newsagent or download your digital copy here.